After gaining international fame, Delbert Anderson and his ensemble bring their music home. Delbert Anderson and his jazz trio play a bebop song that moves as quickly as a Chevrolet Bel-Air cruising down nearby Route 66. Warmed up and loose, the Navajo trumpeter plays a tune appropriately titled “Opener” — the church crowd in his palm. A smattering of mostly older Caucasian listeners sit politely in the pews, tuned to the three-piece ensemble. If you stand outside the Church of the Holy Spirit where Anderson plays today, or anywhere in Gallup, New Mexico for that matter, you catch the din of train traffic — more of a roar the closer you get to Route 66, the town’s mainline. That lonesome whistle a blowin’, as Johnny Cash sang, lends an element of romantic transience to the town as if one could simply hop a train somewhere out west with more opportunities; Perhaps Phoenix or Los Angeles, if you have the courage. Drive toward downtown and you’ll pass by pawnshops filled with beautiful turquoise jewelry from local Navajos who could surely sell the items for a much better price in Santa Fe. A walk through the town square on a cool summer evening will yield a reward of Zuni dances, but you’ll pass a few homeless Native folks on the way. Gallup is a town of unforeseen pairings. Gallup is a town so cool that Bob Dylan claimed it to be the place of his birth. The Delbert Anderson Trio during filming for their music video “Groove Warrior. Anderson and his trio have no problem playing here, or anywhere for that matter, for their calling is to spread the gospel of jazz. New Mexico is not a place you think of when you envision jazz, and it’s not so easy to get a gig around the corner from your flat: The Blue Note isn’t a subway trip away. In fact, this church gig — a benefit for battered family services — is a two-hour drive from Farmington, New Mexico, the home of San Juan Community College where Anderson teaches music. Earlier, Anderson and his band mates unloaded their instruments outside the modest church that sits atop a hill overlooking Gallup. The town rises up from Route 66 steeply to this point – “the higher the hair, the closer to god” one might say. As they unloaded, they discussed the set list, standing around, riffing off each other in a ritual that they’ve participated in countless times before. It’s similar to the way they play a set: Delbert calls out the songs and the band comes together as a team to decide which way they’ll go, this song or that. The band has played clubs, state fairs, Native art festivals, anywhere the call goes out: If there’s an audience, the Delbert Anderson Trio will preach. That includes today as they spread the testament of jazz to Gallupians as well as Navajo and Zuni citizens and anyone who may venture into town from the surrounding reservation areas to hear the good word. 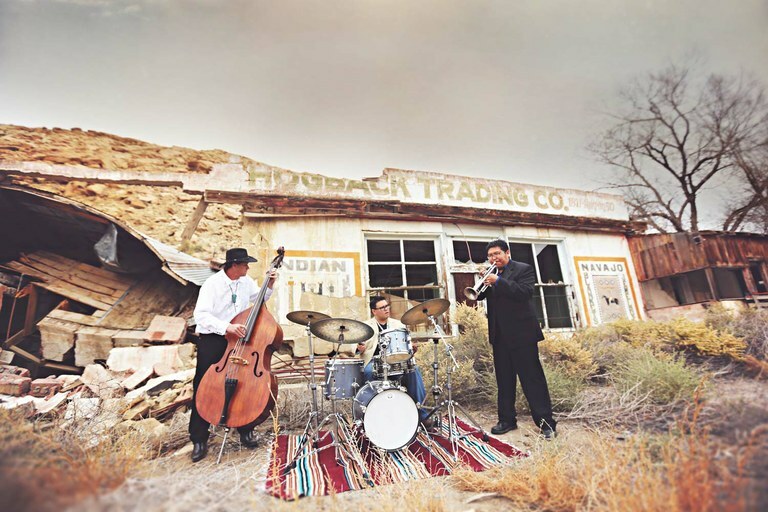 Drummer Nicholas Lucero, upright bassist Mike McLuhan and Navajo bandleader Delbert Anderson have been playing together for approximately three years. Anderson greets the crowd, thanking them for coming out and raising money for battered women in Gallup. It could be mistaken for a perfunctory gesture, but Anderson is sincere in his love for the process: the greeting of the people, the playing of the music, the performance. With that, Anderson launches into the first song of the set, goosing the audience. What was once a quiet sanctuary of spirituality has now been transformed into a live music venue, and it swings. Much of the crowd wears their Sunday best, as if wearing anything else is an afterthought in this venue, while others sport the local Gallupian cowboy garb: blue jeans, snap-button shirts and hats emblazoned with the names and logos of local businesses. A walker is politely placed as close to a pew as possible so as not to trip anyone up. The congregation listens appreciatively and claps at the right moments and after solos, knowing full well the protocol of jazz. A church elder remarks that the drummer reminds him of the big band percussionist Gene Krupa. 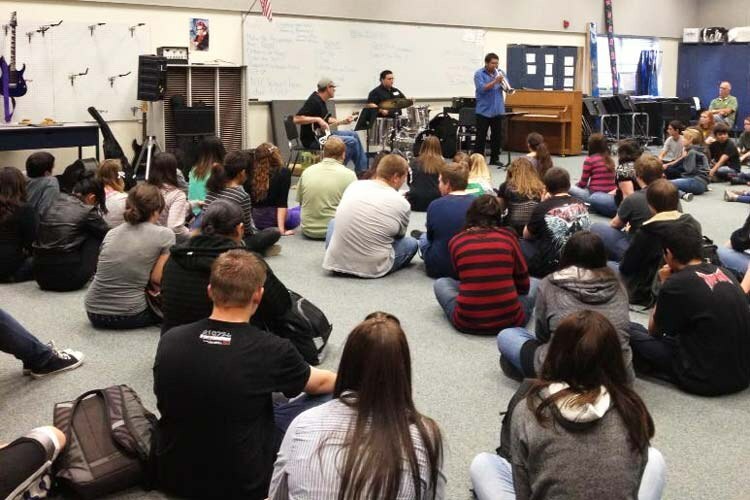 In addition to playing performances together, the Delbert Anderson Trio exposed younger generations to jazz music through education in schools. Here they teach students at Piedra Vista High School in Farmington, New Mexico. Two thousand sixteen was a breakthrough year for the band. They landed a top-ten spot on NPR’s Tiny Desk Concert competition and their music video for the song “Roadrunner” was featured on the outlet’s website – no small feat considering that over 6,000 artists entered the contest. The video for “Roadrunner” features a fourth band member: Navajo lyricist Christopher Bidtah, also known as Def-I. A recent addition to the band, Def-I has proved to be a popular addition to the group and DDAT – the name the band calls itself when Def-I is in tow. With Def-I new material takes shape on stage, something decidedly more contemporary. Lyrical tales of driving down I-25 then whipping down a desert road to a new adventure rise with staccato horn beeps, deep bass thumps and a snare drum keeping beat. Anderson has found a way to fuse two genres to connect with the #NoDAPL generation of Native youth who have found a proper cause to fight for, their soundtracks already filled with bass-heavy-beats and proclamations of Native pride and resistance, their clothing embellished with Native-positive slogans like “Strong, Resilient, Indigenous”, their heads crowned with large-brimmed Billy Jack hats with eagle feathers affixed to their hatbands. Def-I is one of several lyricists speaking for this generation while Anderson, Lucero and McLuhan provide the tune. Today, however, Def-I is in California working on another project while Anderson preaches jazz in Gallup. There’s no animosity in his voice when Anderson relays this information to the crowd and Def-I’s absence gives the band a chance to return to its three-piece jazz roots for a bit. The church gig also gives Anderson an opportunity to pay homage to his faith: the trumpeter grew up in a church family with a ministry. His father and grandfather are pastors and Anderson runs a bible study class as well as a revival when he’s not teaching music in Farmington or playing. After the gig, Anderson, Lucero and McLuhan split their CD sales, a mixture of cash and Square transactions, break down instruments and pack up their cars. Lucero takes off quickly to make a flight while McLuhan, who has a girlfriend in tow and is in no rush, leaves second. Anderson hangs out a bit longer, grabs a small cup of punch and a few cookies, and talks more with the church committee in charge of the benefit show. Anderson needs to get to the nearby reservation town of Crownpoint to pick up a few speakers for another performance, but he also wants food. He eventually opts for dinner – green chile enchiladas and an iced tea – then fires up his battered Ford Mustang and drives back home, to the Navajo Nation.